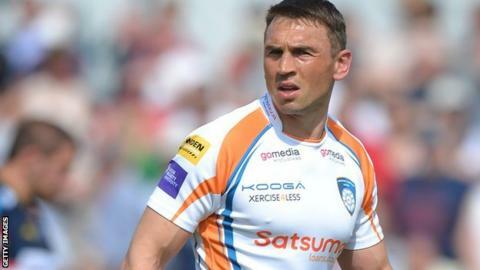 Leeds Rhinos legend Kevin Sinfield has said he would have regretted not testing himself in rugby union. The 35-year-old brought an end to his sporting career after Yorkshire Carnegie's Championship play-off defeat by Doncaster Knights. Sinfield had been signed on an 18-month deal with Carnegie but announced his retirement last month. "I'm really glad I did it. It was something that was on my bucket list," he told BBC Radio Leeds. "It was something I felt I needed to do and if I'd not took the challenge on I would have regretted it for the rest of my life. "I know I've only done six months instead of 18 but I just felt the timing was right and you don't want to push too far." Sinfield led the Rhinos to seven Grand Final wins during his 13 years as captain of the club and coach Brian McDermott has said he would welcome him back at the Super League club. But Sinfield, who made his professional debut at the age of 16, says he is looking forward to his retirement. "I can still keep myself fit and healthy because my body is intact and there's lots of challenges I'd like to do for charity," he added. "I want to find a line of work that makes me want to jump out of bed in the morning and it'll be nice to have my weekends free to spend time with my family. "I'll miss playing, I've no doubt about it, and I'll get behind both teams and hope they can have great success in the coming years."